Pip's class are sending off big red helium balloons to celebrate their school's 100th anniversary. They ask the people who find them to tell them how far they'd gone. One lands just down the road, one is found in the next town - but Pip's flies all the way to Buckingham Palace! One of the things that young disabled readers often remark upon (and their parents often deplore) is the fact that most books that feature such children tend to be 'issue' books. So I wrote Big Red Balloon . It's for readers of about 5 to 9 years in age. 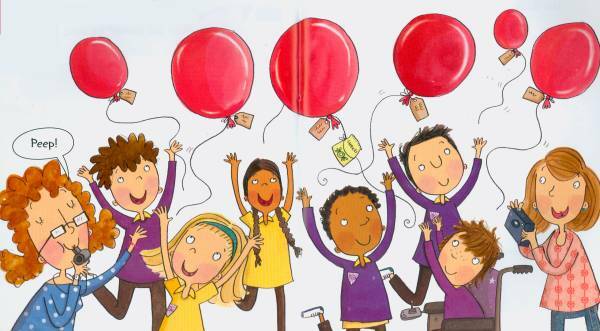 Pip's in a wheelchair, but that only shows up in Kate Pankhurst's wonderful illustrations, as we see all the pupils at Sunnyside Primary let off a helium balloon to celebrate the school's 100th year anniversary. Whose balloon will travel furthest? It's Pip's. Her big red balloon lands in the palace garden, and on a whim the Queen invites Pip to tea, to show her where she saw the flash of red and mistook it for a torn piece of one of her corgis' jackets. And here in the story Pip reports a rather poignant exchange. "It floated a very, very long way," I told her. "Yes," said the Queen. "That is the thing about balloons. They can float free, wherever they choose." "Go anywhere they want," I agreed. She sighed. "Not like people." She turned and looked at her enormous palace as if she'd suddenly been asked to mop the whole place, every single room, all by herself. She looked so sad. Maybe, I thought, she never wanted to be a queen, at all. Maybe she wanted to be one of the things that I might be when I grow up. A teacher or an artist. A writer or a librarian. A lawyer or a doctor. Some people have all the opportunities in the world. Most of us don't. It's cheering to think that a queen, and a disabled child like Pip, have at least one thing in common. And, for me, the loveliest thing about the story is that the idea came from an article in a newspaper. Yes, one of these competition balloons did once land in Buckingham Palace Garden. And yes, the queen did invite the balloon's owner to tea. 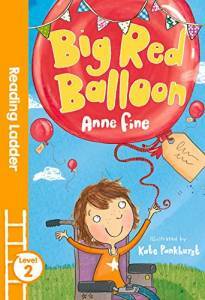 Big Red Balloon is a book by Anne Fine for younger children and is illustrated by Kate Pankhurst. It was first published in February 2012 by Egmont Books, in their Blue Bananas series of chapter books for beginner readers. It has now been reissued as a Level 2 Reading Ladder title, perfect for readers who are growing in confidence and are beginning to enjoy longer stories. Click the logo to order Big Red Balloon from . Text © Anne Fine, 2012; illustration © Kate Pankhurst 2012.